Believing in yourself and loving yourself is something many women and even some men all battle with in everyday life, it’s one of the hardest things to do in the world! Many of us don’t know about the power we possess within ourselves until later in life. I think all people deserve to be loved and empowered. That’s why I’m such a believer in the quote, “Always wear your invisible crown”. That quote can mean many different things to many different people. 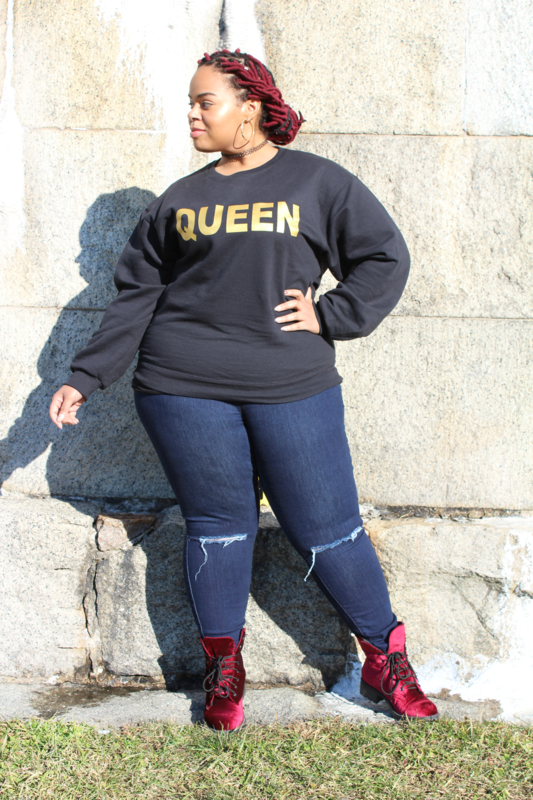 While browsing the Internet (as I usually do), I discovered this awesome shirt on REBDOLLS that had the word QUEEN written on it. 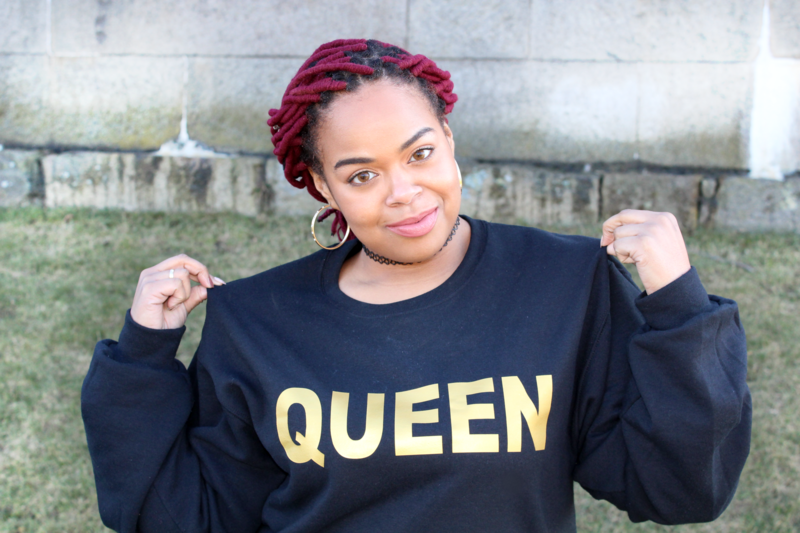 Now me being a former beauty pageant girl, I was like “shut up and take my money”, But the slogan on the sweatshirt meant a bit more to me than just the word QUEEN. 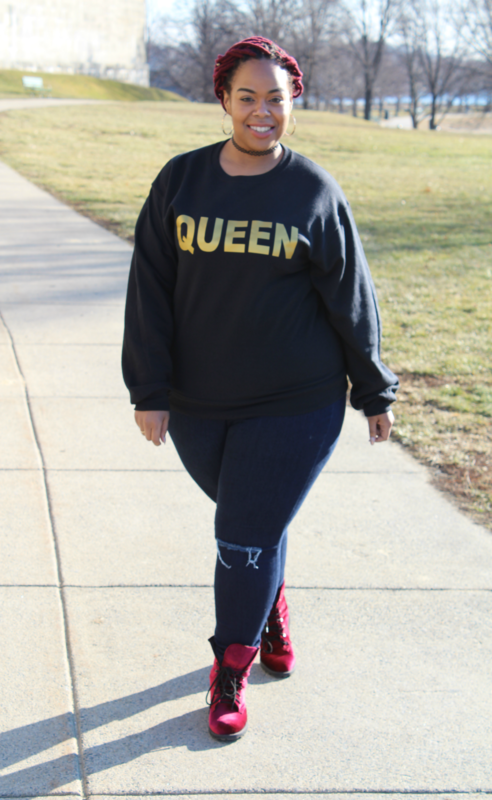 For me, this sweatshirt mimics the way I live my life daily as the queen that I am. I try my best to always remain positive and smile as I take on life. I remember to always remain confident because loving myself first is important. If i don’t hold value within myself, who else will? 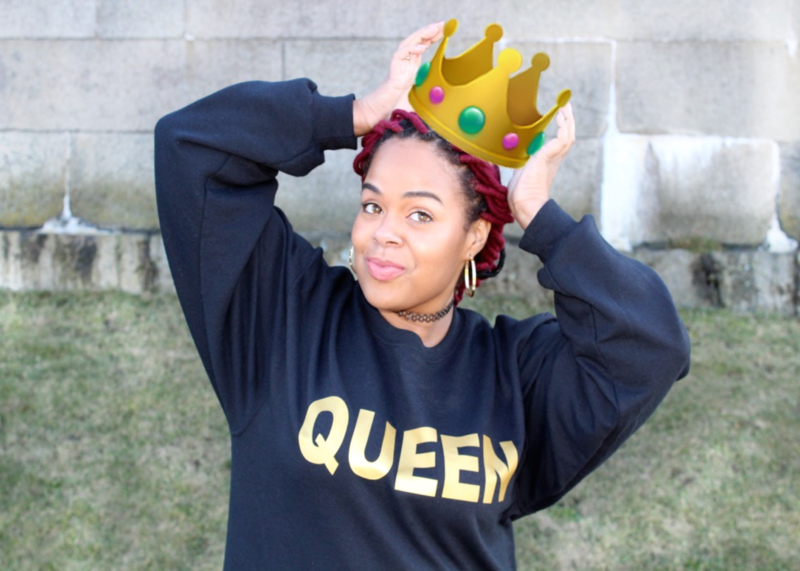 My queen sweatshirt symbolizes me walking with my invisible crown, showing power, confidence and strength. My eagerness to take on anything that comes my way. 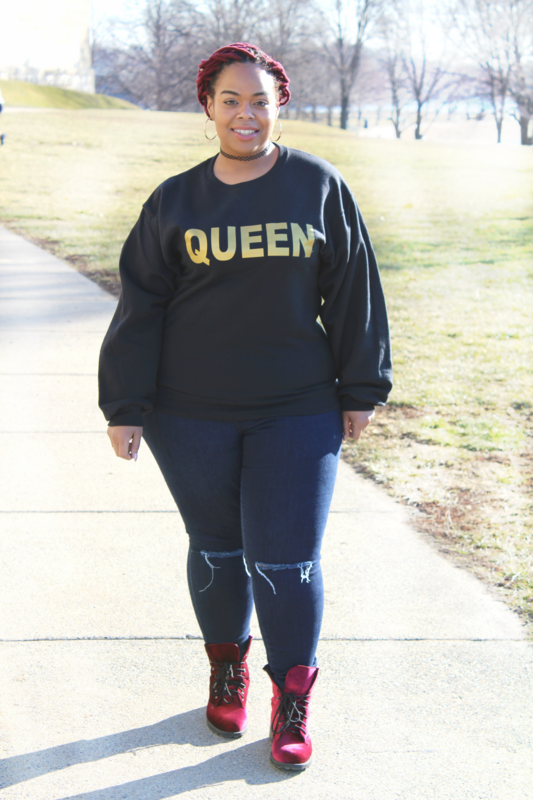 I love the fact that Rebdolls has such an empowering sweatshirt for women of all shapes and sizes to enjoy. 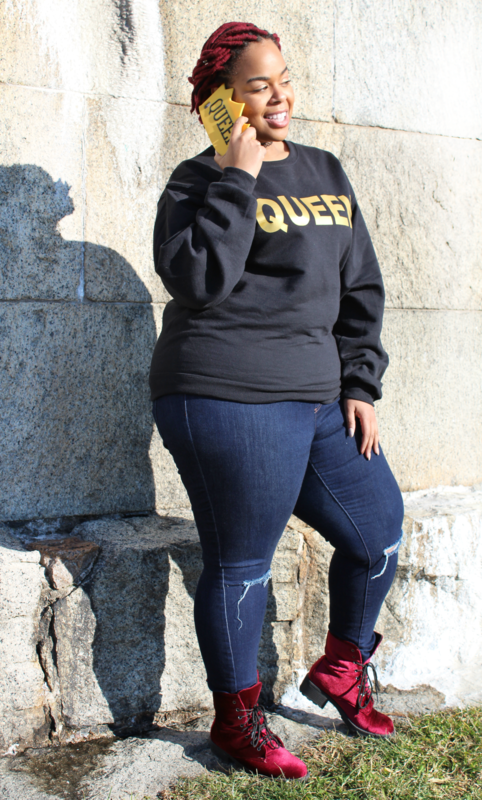 If you are interested in showing your inner queen, make sure to head to Rebdolls and get your QUEEN sweatshirt available in sizes small-4x. Currently I’m wearing a large and recommended to size down. This shirt also comes with a crop top option if you want a different look. I hope all of you enjoyed reading my post, but most of all I hope you all remember to uphold and treat yourselves with the love and respect you deserve. We are all kings and queens and should live our life as such. Until next time keep on living life like the royalty you are hunny! Self love, respect and values are so often looked over but so importsnt for how we allow others to treat us! Thanks for sharing! I love that sweater and that it comes in all sizes! You are so inspiring and I couldn’t agree with you more!! Love your shirt, love your invisible crown and keep on rocking! I need that sweet! I love the velvet boots too! I think I’m just gonna run you for your outfit! K THANKS! Yes ! Yes ! And Yes ! I love this and you look absolutely amazing! Such a great message and style ! QUEEN! Currently bowing to this post. 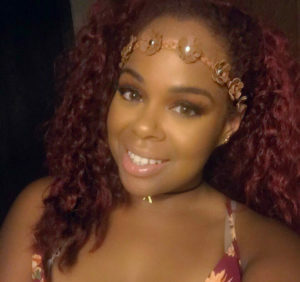 Thank you for such an inspiring post girl! Keep on slaying with your crown! YAS! You are on amazing woman! Absolutely love reading this post babe!!! Loving yourself is one of the things we all need to do more as persons.